A 6 months old baby girl from Iraq who was diagnosed to have Heart defect since birth was advised to have complete evaluation about her Cardiac status. Their family members decided to consult one of their family friends in India & as per their advice they Opted to came to India for treatment. Preliminary report was sent to Dr.Prabhu Halkati based upon which he had advised them to come to Belagavi for further evaluation treatment. She was issued a medical Visa on the basis of advice given by Dr.Prabhu C. Halkati Parents also had consulted another hospital in metropolitan city & as they had advised Surgery with High Risk & expensive Package they opted to come to Belagavi for treatment. Dr.Prabhu C. Halkati had carried out a complete evaluation of her Cardiac Status with Echo & referred her to Dr.Amrut G. Nerlikar (Consultant Cardiac Surgeon) for surgical treatment. Team of Doctor from Lakeview Hospital evaluated the patient & was diagnosed to have (Complete A-V Canal defect with Severe PAH Severe AV regurgitation with a large PDA). Things were complicated as then child is having Down’s syndrome & was weiging hardly 4.3kgs. 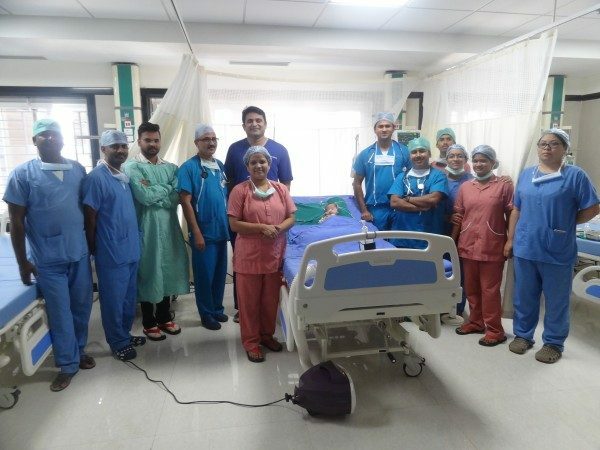 Cardiac Surgical team which included Dr.Amrut Nerlikar, Dr.P C Halkati, Dr.Prashant M B, Dr.Sunil Kumar, Mr.Prashant Hiremath, successfully operated upon the child & she has made excellent recovery. The child no more turns blue & feeds well. The srugery nearly went on for over 4 hours 30 mins and the surgery has costed them ¼ the Price they would have spent in any Western Country. This also would open up the gates for Medical tourism in North Karnataka as Belagavi is well connected to Bangalore, Mumbai Goa by air.